I love setting goals and achieving them, and creating a successful life for myself. But I’m not willing to give up my femininity for it. I still want to enjoy my life at the same time and don’t believe that’s too much to ask! The old-fashioned way of being successful was very masculine. I love listening to Brian Tracy and I have received so much motivation from him since I first came across him in the early 1990s – thank you Brian :) – but I have come to realise that I don’t need to follow his way, or anyone else’s way apart from my own, to find success. I love that we can all be inspired by others and take our favourite bits from each to create our own custom blueprint. The surest way to end up living a live that you are absolutely in love with is to design it yourself and go after it with all you’ve got. So, on that topic, may I share with you my favourite ways to be a chic success. ONE. Decide what success looks like for you. I used to feel bad that I never wanted to go to university, so I haven’t got a degree. Now I see that it doesn’t matter for me, and I probably would have been miserable working as a white collar professional. My ultimate values are peace, freedom and creativity. Do they sound like they would be satisfied if I was, say, a lawyer? Write down all the things that are important to you and see if you can pick out your top three to help you define success for YOU. TWO. Accept your current reality. Decide that where you are right now in life is exactly where you are meant to be. There is no point looking back into the past and wishing things could have been different. What a waste of mental and emotional energy. Wouldn’t it feel much better to know that you are here, right now, because you are meant to be? I think it does, and it feels like you can then go forward from a solid and grounded place. THREE. Take your top three values and ask yourself how you can bring them into your life. For me with creativity, I desire the time to spend on my sewing, knitting and writing. It means I have to set aside time for those pursuits and set up areas where I can do them. I have my desk and computer, but I also make time to daydream with my notebook and pen (first thing in bed with hot tea is wonderful). FOUR. Don’t be a victim of your own laziness. As much I desire to be a chic success, it takes effort and sometimes I am not willing to expend that effort. It doesn’t feel satisfying to be slothful though – sometimes yes, but not all the time. It’s easier to major in the minor things, but success comes more when you do it the other way around. Generally I have a few items that I prioritise for my day, such as writing this blog post, writing a chapter, or starting a sewing project. Then, at the end of the day I feel like I have achieved something and yes, I do feel proud of myself when I have completed something I said I would - it definitely gives you a welcome boost. FIVE. Make fun the priority. Another misconception about leading a successful life is that I thought I’d have to knuckle down and put aside fun things to get there. I still have that belief etched in my mind, but I am slowly breaking it down and letting myself feel relaxed and joyful as I work towards my goals. I know it’s all in my mind, so I am slowly changing my thoughts from leaden heaviness to that of a light balloon. And that's it! My favourite, fun, easy ways to feel like a chic success every day. You might think that being this way you won’t get anything done, but I am here today, living proof that the opposite is true. Everything I have achieved: writing and publishing my books, having a happy marriage, my husband and I deciding to change our entire lives and move to somewhere that feels more aligned with our internal landscape; these all came about as a result of following these five steps towards success. From what I’ve read on others blogs and social media accounts, the old-fashioned way of success isn’t working for many of us. We want more, but we also want less at the same time. More fun, time, playfulness and yes we need to earn money for that, but we don’t need to give our life over until retirement to enjoy ourselves. Less stress, less possessions, less busy-ness. Without thinking too much about it, what would be your top three values? And, for bonus points, how could you incorporate one of them into your life right now, today? 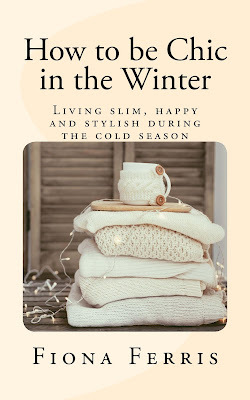 Find 'How to be Chic in the Winter' here on Kindle or in paperback. 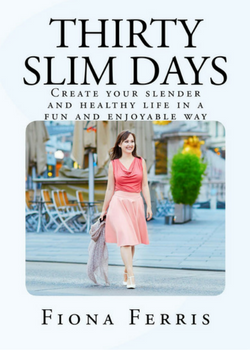 Find 'Thirty Slim Days' here on Kindle or in paperback. Just catching up with your posts, so excuse me if I ramble! Wasn't 2017 a wonderful year? BIG. It was in my world too. Lots of changes: a new home just built (no more renting :-), then being directly hit by a hurricane. Got through it all though. I love your decorating spree; lucky you to be near an auction house. I just love pre-owned almost everything, for the quality and history and even the lack of worry. New makes me uptight. So this new home is quite an experience! Your success tips are wise; when you no longer worry about what others think of you and find your own way, it's so freeing. That usually comes with age. Your goals for 2018 sound amazing, continued luck and ease with your writing. Your photo is lovely; what a pretty mirror and lilies! Defining our own idea of success instead of adopting society's version of success is such a smart way to achieve actual success. I tried society's way for a long time and it wasn't very fulfilling. Now I'm living differently and enjoying life so much more. Wonderful post Fiona. It's so nice to see your insights into this topic. I really enjoy your blog, Fiona. I bought 30 Chic Days a while back and really got a lot out of it. I am on my second reading of it now. It really made me pay attention to how I 'am' and also made me start taking a bit better care of myself. I am currently going through all my clothes and turfing out anything that doesn't make me feel terrific. I just bought 30 Slim Days so really looking forward to that turning up in the next week or so. My top 3 values are peace, simplicity and creativity. Today I'll honour my peace value by taking the afternoon off from all my house chores. Creativity, elegance and a zen-atmosphere (of which beauty and peace would be inclusive). I love this post, simple yet very profound. You always inspire me. The fun aspect is so true. It's terrorizing to ourselves and others when we make every achievement a dry, grueling prospect. Hi Fiona, my three values would be home, family, and purpose, and realizing that while family is top of the list, my own personal purpose (not just being a wife/mother) is also a priority - that sometimes gets a tad confused/bogged down, but I am working on that daily as something i have to persue. Thanks for a thought provoking post - it's something I need to think about right now! I would like to say, though, that I know quite a few creative people with degrees, especially in the media, libraries and the art world. But I agree that you certainly don't need a degree to be creative, as Monet, The Beatles and Shakespeare kinda proved! Great post as usual! I would say for me that my top 3 priorities are 1) my faith, being authentic in what I believe and why I believe it is most important to me. 2) Elegance and manners; elegance takes you further than what you believe. People pay attention to how you carry yourself whether it be good or evil. And lastly, being excellent in all I do. Running an excellent home, being an excellent wife and mother are so important to me. Being an excellent paralegal at my job is important to me also. Having a life filled with excellence is priority to me because provides substance in ways that we do not know. Thank you again for your wonderful post!